(8) Whatever: Is a woman’s way of saying UP YOURS! If you don’t know Quween is by now. Your betta get you some schoolen! Quween is a black homeless woman who lives in Hollywood… She is becoming a star on You Tube. I first saw her advertisement as “Body Guard to the Stars”… She is hilarious! 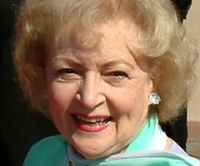 We’ve lost a lot of icons recently — but no matter what NBC says, Betty White isn’t one of ’em! During a report yesterday morning at Forest Lawn Cemetery, “Today’s” Michael Okwu listed the “Golden Girl” as one of the celebrities already buried there. Meredith Vieira corrected him — he probably meant Bette Davis. Does Anyone Feel Like I do about Michael Jackson? This again gets my blood boiling. Maybe it’s my night to examine people and things and look at how asinine people can be. I’ve seen bits and pieces of Michael Jackson’s memorial service today, and I would say that it was really eloquent and a wonderful tribute. My god, when Paris Jackson spoke at the end, I don’t think anyone could question Michael’s love for his children and their love for him. What riles me up is the way that all spoke of Michael as if he was this wonderful human being, the greatest person of the century. Maybe he was…I don’t know, since I’ve never met him and have only read and heard things like the rest of you have. I have no idea what kind of man he truly was, and quite honestly it’s none of my business, and I won’t pass judgement since our paths have never crossed. My question is…where were all of these celebrities and fans when he was alive? If the way they eulogized him is true, Michael would have loved to have shared more of his life with the public and with them as well. Why in the world did you think he scheduled concerts in England? Do you really think that he would have sold out over 50 concerts in the United States? Where were all of these celebrities when he was being charged with child molestation? Staying clear, that’s where. Now that he’s gone, the world cannot comprehend his death. Sorry folks, but where in the hell were all of these people when he was alive?